Wednesday August 2 2017: Zende’s disappointed by Nicole’s decision, Brooke catches Wyatt and Katie looking flustered, and Zende stands up for Maya. At the after-party in Monte Carlo, Brooke tells Bill that Thomas took a commercial flight home because he misses Douglas. Katie and Wyatt join them on the couches in the lounge area. Brooke questions where they were after the show and Katie flashes to the kiss. Wyatt proposes a toast to the fashion showdown and the people who made it happen. 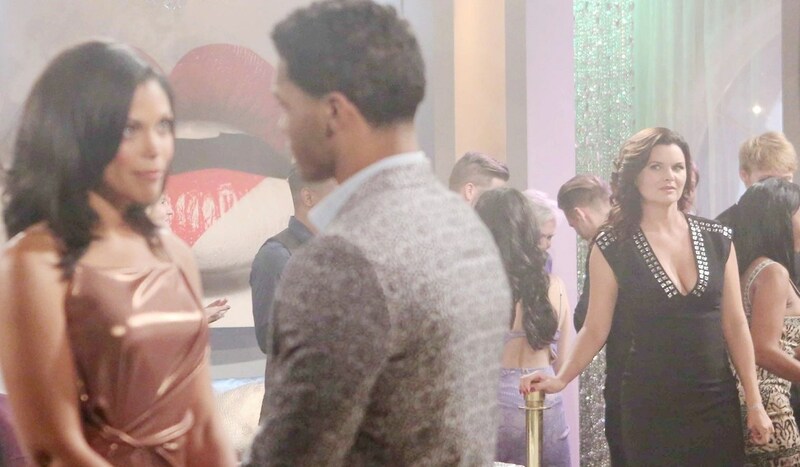 At the after-party, Zende and Maya hit the dance floor, Bill and Brooke circulate, and Wyatt comments to Katie that Monte Carlo is a romantic city. Soon they all convene for drinks as the champagne and vodka flow. A tipsy Zende enthuses that they killed the show. He and Maya return to the dance floor, and Brooke encourages Wyatt and Katie to join them. Zende takes a call from Nicole, who says she’s too tired to join him. Her husband’s disappointed and stalks off the dance floor. Maya follows him back to the couches, where he complains to all gathered that Nicole knew how much this meant to him. Wyatt enthuses that they can still have a good time. Maya toasts Zende, and makes an impassioned speech about how proud they all are of him. After, Bill crows that Katie and Wyatt make a hell of a team, and Brooke chimes in that they really did an amazing job. Wyatt and Katie go to dance, and Maya and Zende join them. Up in the hotel suite, Nicole hopes Zende can have a good time without her. She leaves Rick’s suite after talking her sister up. While Brooke and Bill kiss at the party, Wyatt gets up close and personal with Katie on the dance floor, but she walks away. He follows and they kiss. She worries someone might see them, but he asks, “Who cares?” They make out. Brooke looks for them and Katie’s eyes bug out when she hears her sister call her name. Brooke appears and notes they look a little flushed. They stammer excuses, and Brooke bids them goodnight. Wyatt asks Katie, “My room or yours?” Katie informs him they’re going back to their own rooms separately, despite Wyatt’s best efforts to convince her otherwise. They kiss again. In the lounge area, Zende sticks up for Maya when a mouthpiece calls her a freak. After, Zende tells her she deserves respect and Maya embraces him. Katie appears as she kisses his cheek and strokes his face. Katie shares her thoughts about Maya and Zende with Wyatt. Quinn reacts to encouraging news.